Wishing all a very Happy New Year !! Soak the chana overnite or for atleast 5-6 hours. Pressure cook the chana till soft. Add the onions to the oil. Once they saute add ginger-garlic paste and green chillies. After a minute add the chopped tomato. After a minute add the chana and put in the garam masala powder. Add little water and cook till the chana is soft. For the aloo tikki -Boil 2 potatoes in microwave/pressure cooker. Mix in salt,red chilly powder and garam masala(a pinch) into the mashed potatoes. Make tikkis and shallow fry them. Take curd in a bowl and mix it well with salt and red chilly powder as per taste. 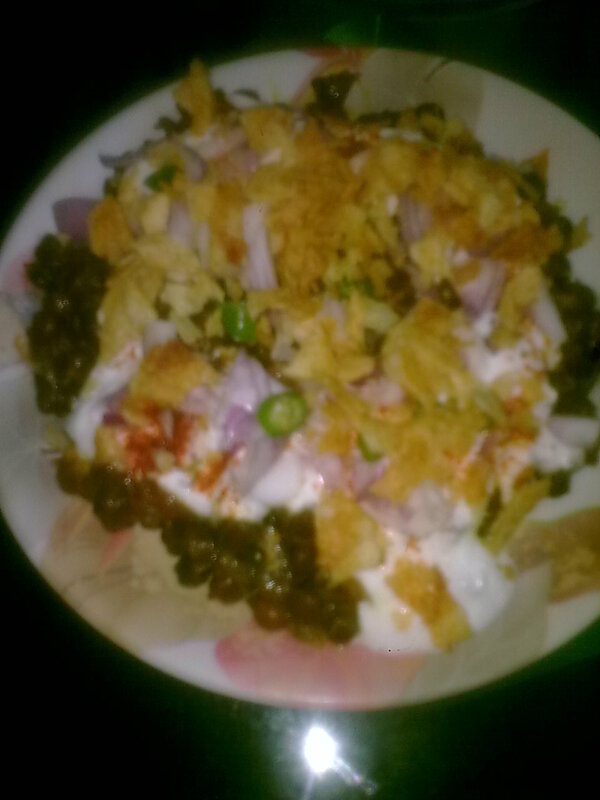 Take a plate.Put in the chana,place curd over it,sprinkle some chopped onions and green chillies,place the aloo tikki,again put some curd,put in the sev/chips.